Use the button to bring the list of input options, and select PC. 1. Ensure the Chromecast device is on. plugged into an HDMI port. Power is obtained via a standard micro USB port supply. When powered on there should be a solid white indicator light. 2. Switch the display to the correct input. Use the button to bring the list of input options, and select HDMI1. At this point you should see the Chromecast welcome screen. Download and Install Google Chrome web browsers if you don't already have it. Note that mirror is not suitable for iPhone and iPad as these devices only handle media streaming. Gog to the setting menu in the top right corner of the Google Chrome browser and choose "Cast". Click on "Cast tab". You may select to cast the current Google Chrome tab, or to cast the whole desktop of your device. Choose the relevant room from the list of Chromecast devices. Open 'Google Home' from your Apps list. Go to the setting menu in the top left corner of the Google Home app, Select "Cast screen / audio". Choose the relevant room from the list of available devices. Many media streams (YouTube, iPlayer etc.) are compatible with Chromecast. You can access these through the Chrome browser or through the player’s app on your mobile device. Look for the cast icon in the corner of the player. Click it and then select the relevant room from the list that appears of available devices. (Please make sure that, you pick the correct Media Room). Do not forget to stop casting, especially if you are mirroring your device’s screen; you may end up accidentally sharing private information with everyone else! While casting, there will be a cast icon in your notifications bar. Swipe down to bring up the notifications panel, and press the cross on the casting status banner. While casting, there will be a cast icon in the top right corner of your Chrome browser window. Click it and you will see an option to “STOP”. 1. Volume control is done through your device and the TV screen. If you’re not getting any sound, first check the volume is turned up on your device AND on the TV. 2. Attempting to share videos by mirroring your screen while playing the video may result in poor quality video and audio log. Instead, load the video in a player like YouTube, then cast as in step 5. 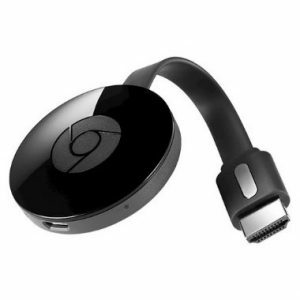 This will automatically switch the Chromecast to streaming mode and result in the highest possible quality video. To switch back to mirroring your screen, just follow step 6 again.